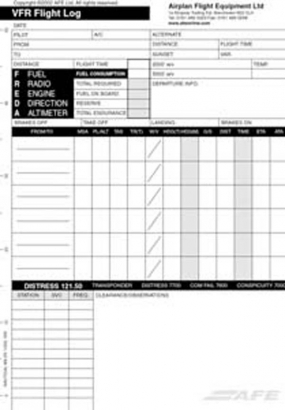 The essential flight planning form for VFR flying, designed to be used with VB1, VB3, VB-LO and compatible kneeboards. All essential pre-flight data and calculations can be entered in a logical sequence that aids flight-planning, including fuel planning. The easy-to-read format highlights essential information and facilitates good cockpit organisation, with space for ETAs and in-flight observations to be recorded. On the edge there is a 1:500 000 scale to aid airborne time/speed/distance calculations and diversion planning. Each pad contains 50 forms.